This latest release fixes, for example H.264 streams in VDPAU (Video Decode and Presentation API for Unix), fixes also DisplayPort audio, and support for latest Linux Kernels, such as Linux Kernel 3.3. You can check here for full features. 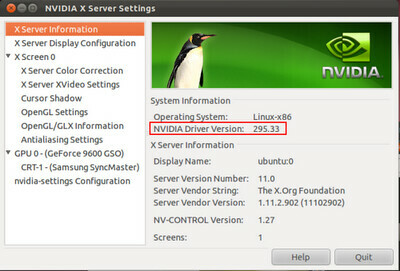 You can install Nvidia Drivers on Ubuntu 12.04 Precise Pangolin/Ubuntu 11.10 Oneiric Ocelot/Ubuntu 11.04/Linux Mint 12/13. 7 comments to ''Install Nvidia Drivers on Ubuntu 12.04 Precise/Ubuntu 11.10 Oneiric/Linux Mint"
I get the error alert that system does not recognize the encoding or smth like this and it suggests to edit it manually or retry. Any ideas? I have one compaq monitor that goes to 1440 x 900 resolution and an HDTV that goes to 1920 x 1080. However, when I was using NVIDIA X Server on 10.04 LTS, I had a dozen or so resolutions to choose from for the TV including 1440 x 900. Now with 12.04 LTS, I only have one HD resolution on the TV which is 1920 x 1080. I was able to set them both at 1440 x 900 so they would be equal, but now I can't. Works perfect on Mint 14. Thanks so much!! !